It’s blog time again and my regular readers (all both of you) are probably wondering how that art quilt is coming along. I only have a week and a day until my sixtieth birthday, which is also my first blog anniversary. My goal for this blog year was to finish fifty creative projects, including a 16” x 20” painting, an art doll and an art quilt. The only thing left is the art quilt and I’m obviously running out of time. I must be working on it, right? Right. Yes. Of course. Only…it’s January and I do have other things to work on in January. My inner critic seems a lot happier if I am working on my tax spreadsheets. They’re long and tedious, but they’re easier to do than an art quilt, because I know exactly how to do them. I’m still trying to figure out how I’m going to make the art quilt. While I’m puzzling it out, I get to work on spreadsheets. As you can imagine, it’s been a fun week. I’m close on the spreadsheets, and I’ve put a lot of thought into the art quilt. I do have an idea. You have to admit that’s a start. I have re-borrowed the sewing machine that I borrowed to make the art doll. It had to go back to my daughter for a while because she needed it to make a fleece dinosaur hat for her six-year-old. Cold weather was coming and he needed a dinosaur to put on his head. What kind of Grandmommy would let her grandson go without a dinosaur hat just so she could work on an art quilt? Some other kind of Grandmommy than this one, obviously. Now he has a hat and I have a sewing machine and an idea. I also have a Temple of Creativity (a.k.a. sewing room) full of interesting bits of fabric, including some fat quarters I experimented with when I was first learning how to dye. 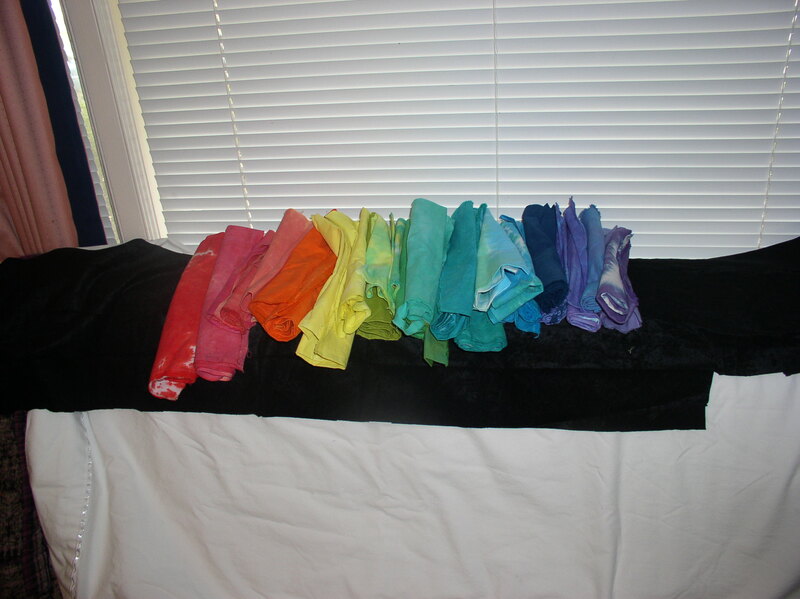 I’m pretty sure I want to use these hand-dyed fat quarters in my art quilt, so I gathered them up and brought them to my living room, where I spread them out on my couch. 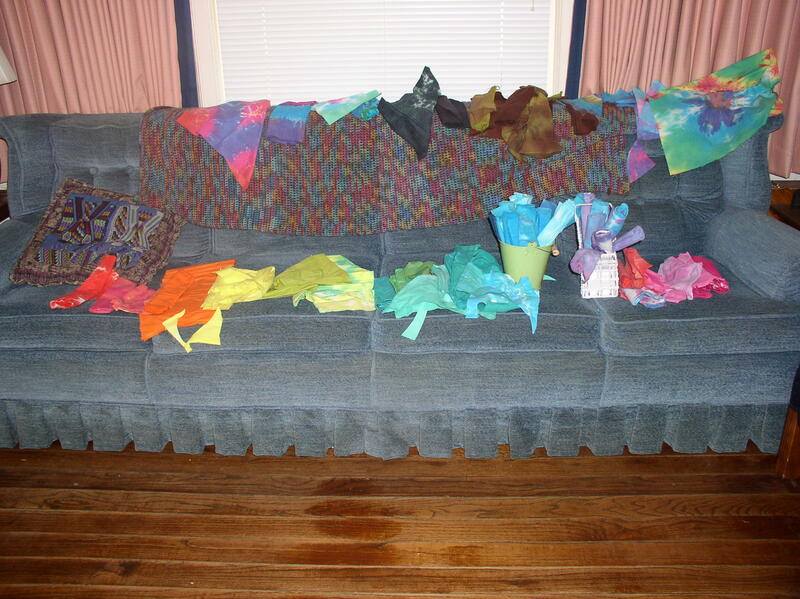 Then I started trying to decide which ones would really end up in the quilt and which ones definitely would not. As you can see, I am making progress. I think these will do. You can probably also see that this is a short blog post. What can I say? I have to get back to my spreadsheets. I mean, my art quilt. This entry was posted in Uncategorized and tagged art quilt, creativity, goals, sewing on January 31, 2014 by releaf1954.